The subject term cultural group should be used with descriptions that relate to individual or groups working towards the preservation of a particular cultural groups or culture community, activities or events promoting the life and values of cultural group(s), movements, initiative, legislation that promotes the existence and participation of diverse ethnic, racial, religious or social groups within larger communities. 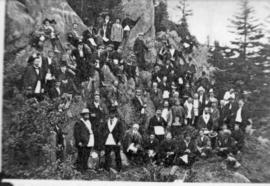 Item is a photograph of Masonic gathering on top of Owl's Head which took place once a year. 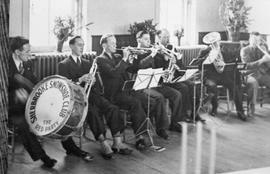 Item is a photograph of the Snowshoe Club Band performing for the Ingersoll Rand Company office party. Item is a photograph of the Mouland Male Quartet of Sherbrooke. Item is a photograph of the Sherbrooke Centenary choir. La pièce est une photographie d’un pique-nique Scandinave à la propriété de Matt Knutson (avec le drapeau) à Waterville le 1 juillet 1012, incluant John Nelson/Nilsson sur la véranda avec le bébé et les familles Bergstand, Reed et Hedenbergh.